Release Date: October 21st, 2005 by Twentieth Century Fox. The Cast: Ewan McGregor, Ryan Gosling, Kate Burton, Naomi Watts, Elizabeth Reaser, Bob Hoskins, Janeane Garofalo, B.D. Wong. 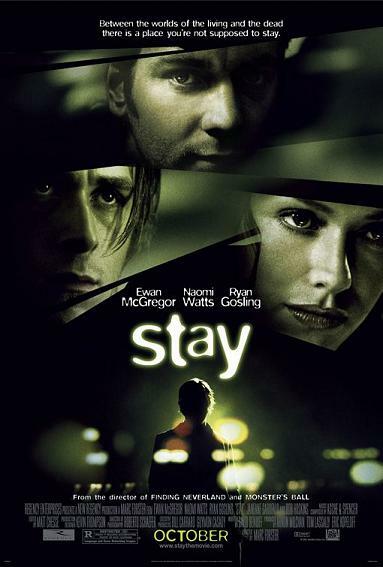 BASIC PREMISE: Psychiatrist Sam Foster (McGregor) has strange experience while treating Henry Letham (Gosling), a suicidal patient. ENTERTAINMENT VALUE: The opening scene hooks you right into the movie as the camera flips over on a street in the point-of-view of a vehicle. This brief scene initially seems pointless, but gradually factors into the mysterious plot. The plot becomes suspenseful as soon as Henry bluntly states to Sam that he plans to commit suicide on Saturday at midnight. The rest of the plot involves Henry to discover why he would want to kill himself. Through his investigation, he witnesses many supernatural, unexplainable events. At the point, the only logical explanation is that he is hallucinating because he hasn’t slept in a while—you begin to wonder who really needs to see a psychiatrist. Even Sam’s girlfriend (Watts) doesn’t understand what’s going on with him. Until the shocking, twist ending, the plot has so many strange characters and weird events that become very confusing and even headache-inducing. The set design is worth mentioning because there are some very well-designed interiors—such as a long, spiraling staircase. At times, the camera tilts at an irritating, dizzying angle. Eventually, Sam’s strange adventures seem just as bizarre as those in Alice in Wonderland, but with a much more chaotic and confusing plot. SPIRITUAL VALUE: The twist ending makes sense once you think about the events that happen throughout the film. However, it’s much too gimmicky to be insightful or to have a point other than just for shock-value. INSULT TO YOUR INTELLIGENCE: A pointless twist ending. THE BOTTOM LINE: Stunning visuals and set designs with a suspenseful plot, but the twist ending doesn’t make the film add up to much other than one long gimmick.